Last summer, when the discussion came of who should christen the new Yankee Stadium by throwing out the first pitch, a bunch of names came up: Reggie, Mattingly, Thurman Munson's family, even George Steinbrenner himself. But really, deep down in the hearts of everybody, there was only one person fit for the job and only one who earned the right. Today, the hoopla of the Stadium opening will range from the modern pageantry and festivities of Kelly Clarkson and F-14s to those who will “tsk-tsk” and finger-wag at the excess. But all sides will agree that everything that is right and large and great about this opening and this day is inhabited in perhaps the smallest man in the Stadium. ...an approachable and unpretentious Hall of Famer who represents a proud franchise not always associated with such qualities. Like DiMaggio in the Simon & Garfunkel song, Berra represents innocence, dignity and success achieved by doing things "the right way." But perhaps unlike the sometimes distant DiMaggio, Berra remained approachable, charismatic, with an almost "Aw shucks!" attitude, even when he was winning the MVP or leading his team to 10 championships. Even after it came out last week that Joba Chamberlain (perhaps unintentionally) insulted Berra by telling a cop that “He might not be as tall as the front of your car,” Berra laughed it off. “Oh, that was funny,” Berra said. “I said, ‘You know I’m your buddy.’ I called him Shorty.” Chamberlain is 6-2. Yogi Berra is the quintessential American Success Story. He grew up in the Great Depression. He served his country in World War II and landed at Normandy. He was passed over by his hometown team—the Saint Louis Cardinals—and worked his way through the minors until his chance came. And when it did, he was ready. Berra is what we all wish we could be: Successful, self-effacing, hard-working, lucky, and just plain talented. 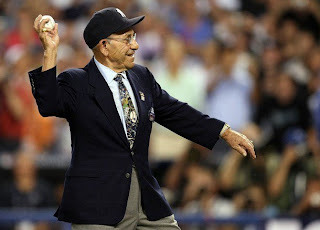 Indeed, Yogi Berra is the only person who should and could christen the new Stadium. And with any luck, some of his qualities will rub off on those who will play in her.